Track all posts of twitter hashtag as well any twitter account quickly. Take the assistance of our tool to measure metrics including twitter impressions, sentiments, viral content for any hashtag and twitter account. Simplify your instagram insights with our tracking tool. Track every information regarding any branded hashtag on a real-time basis. Our reports include metrics like contributors, posts, hashtags, links and more. Get Indepth Analysis of Any facebook page. Identify key metrics of any facebook page with our analytics tool. Grab details like top posts, hourly distribution, hashtags, urls and more with our real time dashboard. 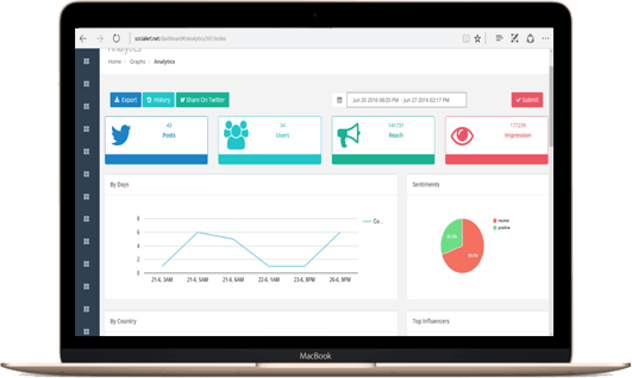 In case you could not track your social media hashtag campaign in real time.Track every piece of information regarding twitter and instagram hashtag campaigns with our historical hashtag reports with no time limitation. With our keyword and hashtag tracking tool, track every keyword related to your brand. Identify the most influential and active users. Connect with them through our dashboard to promote your content and increase your brand’s reach. 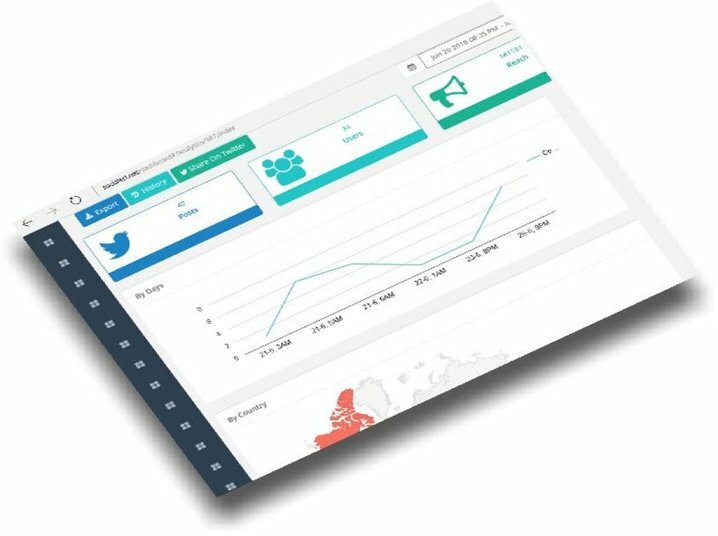 Socialert hashtag analytics presents every piece of information such as hashtag reach and impressions in visual formats. Check hashtag stats like top mentions, active users, retweets, and URL analytics on our dashboard. Always be a few steps ahead of your competitors with our keyword and acccount monitoring. Track their keywords, facebook pages and twitter handles to Unravel their strategy. Find their influencers, customers, viral content, and trending hashtags using our platform. Socialert reports are easy to read and share. Showcase the performance of a campaign to your clients by simply exporting report in excel format. Our hashtag tracking report will help you plan best marketing strategies for your future marketing campaigns. Outshine everyone with our reliable hashtag tracking and analytics tool. With our hashtag and keyword monitoring tool, you can learn how to count tweets with hashtag and analyze its overall impression. Get to know about active users and influencers and come up with engaging content. You can count hashtag mentions, track hashtag usage, and determine how far your tweet got to travel. We also provide top tweets, links, and the list of other popular hashtags to help you understand what’s in and what’s not. Connect your Twitter handles and respond from our dashboard in a timely manner. Have a real-time conversation with your audience and impress them with your dedicated support. "Socialert is a great way to gain additional insight on Twitter past what Twitter Analytics offers. With Socialert you can break down Twitter conversations finding the most active participants, influencers, profile keywords and more. New features are being added regularly and the dev team is very responsive." "SociAlert is a great way to track and monitor hashtags for your business. It's helping me tremendously"
Why choose our hashtag analytics tool ? Enhance the online presence of your brand with Socialert. We have some exciting hashtag monitoring features that no marketer can resist. Obtain the overall reach and hashtag impressions of your campaign on the go. With our competent hashtag tracking reports, you can easily get productive results while saving your time and resources. . Experience the best of Twitter monitoring and hashtag campaign tracking with us. Track hashtags on a real-time basis and never miss a conversation. Be updated with the ongoing industry trends seamlessly. Experience the best of Twitter analytics and hashtag campaign tracking to be a trendsetter. Our tool analyzes Twitter data on a real-time basis, so that you can know what other major influencers and competitors are talking about. Hit the bull’s eye and eliminate every non-productive source with our Twitter tracking tool. Explore our data filters to approach the right kind of audience and track hashtag usage in less time.